In the region of Kapandriti near Athens, a wonderful thing happens. 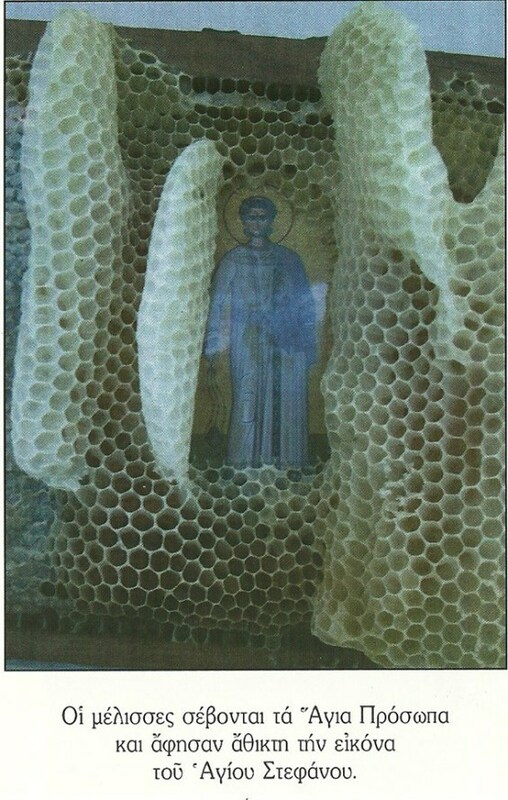 Ten years ago, a devout beekeeper named Isidoros Ţiminis, thought to place in one of his hives an icon of the Crucifixion of the Lord. 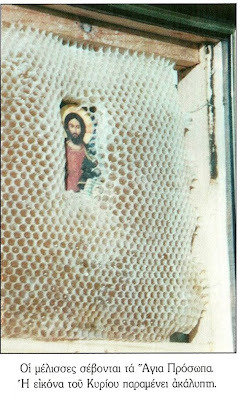 Soon thereafter, when he opened the hive, he was amazed that the bees showed respect and devotion to the icon, having "embroidered" it in wax, yet leaving uncovered the face and body of the Lord. Since then, every spring, he puts into the hives icons of the Savior, the Virgin Mary and the Saints, and the result is always the same. 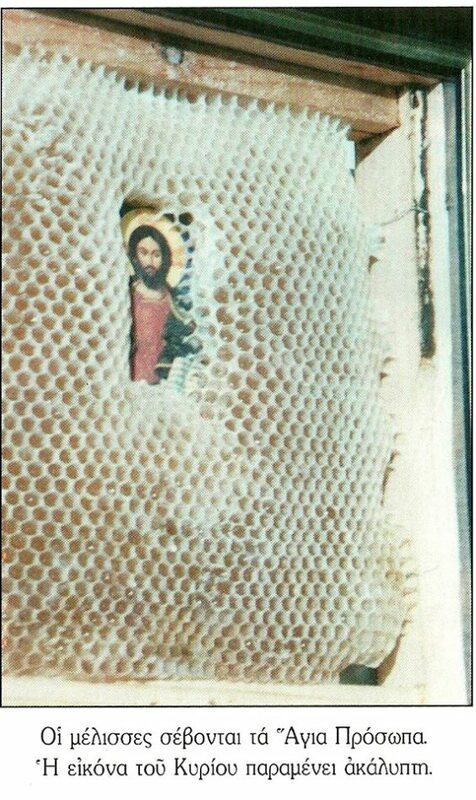 Once I brought a handmade icon from a convent, that represented Golgotha with three crosses. 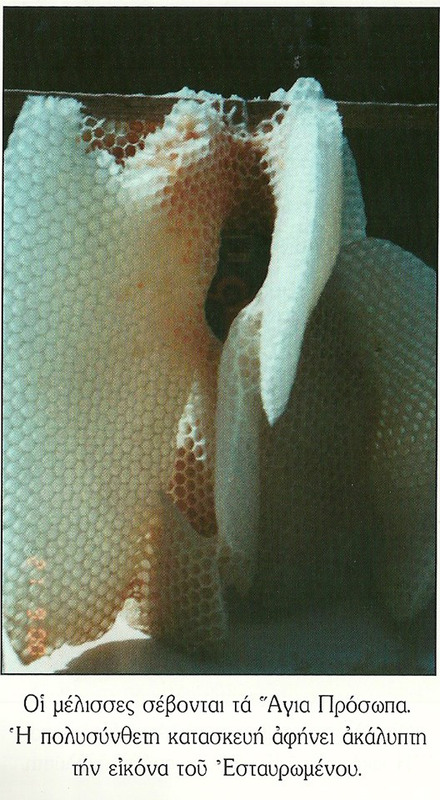 Bees "embroidered" with wax the entire surface of the composition, leaving one to clearly perceive the Cross of Christ and the Thief at his right hand while the thief on the left cross was covered with a thick layer of wax. 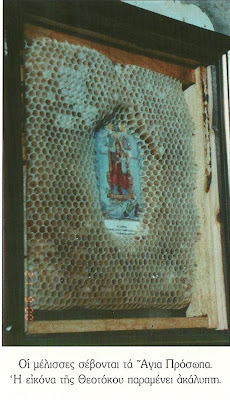 Last time I went, we put in an icon of St. Stephen the Proto-Martyr and Archdeacon, whose name our humble publishing company bears. As you can see from the picture that we publish here, the entire icon is clothed in beeswax, leaving uncovered his face and body. 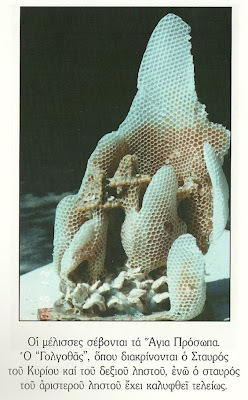 Source: The Saint's Love For Animals and the Animal's Love For the Saints. Translated by John Sanidopoulos.